Last June, a teenager hoping to stow away on a Morocco-bound flight jumped a fence surrounding John F. Kennedy International Airport — and tried to take a selfie when he was caught. In September, a man followed a United Nations diplomatic convoy and lingered on the airfield in an attempt to meet Pope Francis. Two months later, another fence jumper was stopped while walking up a restricted ramp to a passenger terminal. And in a fourth case that remains unsolved, a man confronted on JFK's tarmac menaced an airport worker in December before disappearing. The four breaches of JFK's perimeter security fencing in 2015 are the most in any single year in more than a decade, according to data compiled by The Associated Press. The previous high was two, in 2012. Since the start of 2004, at least 12 intruders have accessed JFK's airfield, 10 of them by hopping fences. 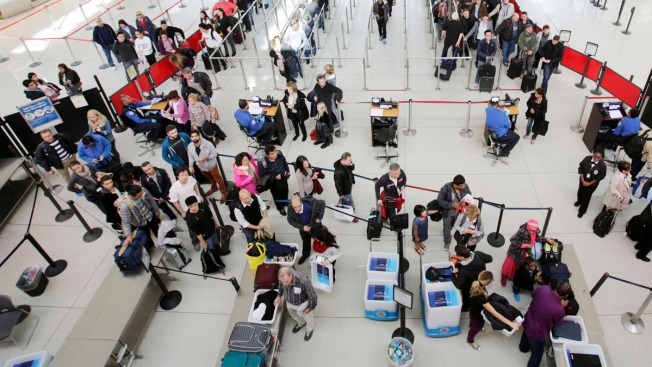 An AP investigation published last year found there had been at least 268 perimeter breaches between the start of 2004 and early 2015 at 31 of the nation's busiest airports. Since then, the Transportation Security Administration provided information on 39 more incidents that airports did not acknowledge to AP. Add in incidents for the rest of 2015 and early 2016, and the total reaches 345 breaches. At JFK, LaGuardia and New Jersey's Newark International Airport, the perimeter security has been breached 17 times, according to Port Authority of New York and New Jersey police reports and federal records obtained by the AP via public record requests. In a statement, a spokesman for the bistate agency's police department said that in recent years officials have added technology that can detect breaches, hardened barriers to stop cars from breaking through and will strengthen the barbed wire on some perimeter fences. "The perimeter fencing at Port Authority airports meets and in most cases far exceeds" federal standards, Joe Pentangelo said. In 2006, the Port Authority awarded Raytheon a $100-million contract to install motion-detection cameras, sensors and night-vision cameras on the fence surrounding JFK and other airports. But the high-tech security has failed to detect fence-jumpers in the past, including one high-profile 2012 case in which a man climbed the 8-foot fence and crossed two runways before asking for help. Most of the previously undisclosed cases in New York involved fence jumping, the records AP collected show. They include a 2007 incident in which a man suspected of being intoxicated and carrying a backpack full of clothes was stopped walking under a DHL Aviation plane on his way to a cargo building at JFK. In a 2012 case, a Connecticut man scaled a pole to hop a fence near JFK's Terminal 4, where he was arrested minutes later and two gates away from the Caribbean Airlines flight he told investigators he wanted to board. Airport perimeter breaches were thrust into the spotlight in 2014 when a teenage stowaway climbed a fence at a Northern California airport, tucked himself into a jet's wheel and endured a six-hour flight to Hawaii. That's similar to what Salim Lebbar said he wanted to do when he hopped a fence between Terminals 1 and 2 at JFK last June without a passport and walked toward an aircraft, according to police reports. "I was going to try and get on the plane to Morocco," Lebbar, then 17, later told investigators, explaining he wanted to visit his parents. Kemoy Redguard, a security guard who noticed Lebbar, said the teen looked out of place in a yellow T-shirt, black pants and gray sneakers. Redguard stopped Lebbar, mindful not to be too confrontational without knowing more about his intentions. "He wanted to take pictures, like a selfie," he said. "I sat him down and had a conversation with him." Lebbar was charged with criminal trespass but prosecutors agreed to drop the case in August if he stays out of trouble. His attorney hasn't returned a message seeking comment. Last November, a 26-year-old man with bruises and scrapes on his face admitted to investigators he'd jumped a fence and walked on a ramp before he was stopped near Terminal 4, according to a police report . He was taken to a hospital for evaluation and charged with criminal trespass. A month later, another report shows, a man dressed all in gray flashed a white piece of paper when asked to show ID in the taxiway at JFK's Terminal 8. The man said he was looking for the subway when confronted, used a profanity to tell the witness he "better not say" anything and then ran off before officers arrived, the reports says. Four months later, the case remains unsolved. Bobby Egbert, a spokesman for the union that represents Port Authority police, said that port officials have invested too much money and faith into a multi-million dollar security system at JFK designed to detect breaches. The technology is plagued by false alarms, Egbert said. "Perimeter security at airports is a difficult thing to monitor to begin with, especially at JFK," he said of the nearly eight-square-mile airport. "It is difficult and it is manpower intensive. That's just the way it is."